Sure, everything is bigger in Texas, and that includes a high school football stadium so grand and high-budget that it garnered national attention last year. 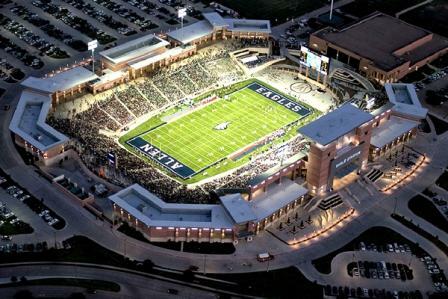 The $60 million Allen High School football stadium, located in the fast-growing Dallas suburb of Allen, TX, features many architectural bells and whistles, including concrete seats for 18,000, a towering upper deck, a spacious weight room, and practice areas for the school’s wrestling and golf teams. With its 100,000 square feet of metal composite material (MCM) panels, the structure looks more like a college stadium. According to Zeke Miller, President , The Miller-Clapperton Partnership, Inc. @thepanelguys, Austell, GA, metal is a natural fit for stadiums of all types. “Obviously this project is like a dream assignment, where certain features lend pizzazz, and MCM panels fit the bill.” He adds that MCM panels are the modern day sheet metal because they do not oil can, are low maintenance and durable, and provide design flexibility. The paneling itself can be clad with decorative metal, which is perfect for all stadiums. The only drawback to stadium projects is that there is no messing around with deadlines, Miller says, because the football season always begins on schedule. Miller-Clapperton, whose projects include the Ben Hill Griffin Stadium at the University of Florida, is currently hoping that his MCM panels will be incorporated into the design of the new Atlanta Falcons Stadium that is scheduled to open for the 2017 NFL season. 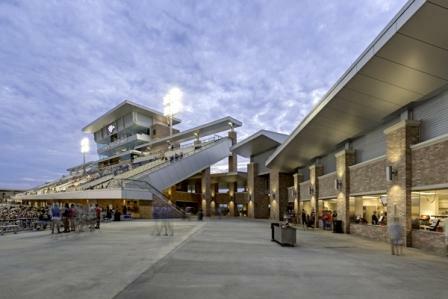 Since the stadium opened in August 2012, Allen High School’s Eagles football team hasn’t lost a single home game, but Miller resists attributing the streak to anything associated with the stadium’s metal composite paneling. Still, with all the publicity surrounding the “most expensive high school stadium in America,” Miller says that he kind of wishes that the stadium was better known for its panels rather than the other way around. Wow heard about this stadium a while back but I didn’t realize the size of it until reading this post. Congrats to MCM for executing such an amazing project. Pre-engineered metal components are the wave of the future.